In a game that nearly resulted in one of the biggest upsets in high school football this season, No. 3 Kamehameha held on to defeat Damien 21-14 last night in an ILH battle between the two Kapalama-based schools at Kamehameha's Kunuiakea Athletic Complex. With 3:34 remaining in the game, Kamehameha quarterback George Kaai found Aaron Nichols on a 41-yard touchdown pass in what turned out to be the game-winning score. Damien drove down the field in hopes of a tie, but with 5 seconds left in the game, Monarch gunslinger George Martin was intercepted by Danson Cappo to end the game. "It's a sick feeling," said Damien co-head coach Dean Nakagawa. "We played hard, we played well. Our defensive staff put a good game plan together. We wanted to take away what they do best and see what happens, and we came down (to a few plays) and that was the game. Justin Saniatan returned the opening kickoff 82 yards for the Warriors (7-2, 3-1 Interscholastic League of Honolulu) to the Damien 16-yard line. But Kamehameha quarterback George Kaai was intercepted by Brenton Kanno, giving the Monarchs the ball on their own 6-yard line. But, on the next play, Kamehameha forced Martin to fumble and Parker Paredes recovered the loose football and ran 6 yards for the touchdown. On the ensuing drive, the Warriors had the Monarchs stopped on fourth and 20, but a roughing-the kicker penalty on the punt erased the advantage, and gave Damien a first down. After the Monarchs (3-3, 1-3 ILH) drove to the Kamehameha 4-yard line, running back Kealoha Pilares took advantage of the opportunity and punched through the defensive line for a 3-yard touchdown run, 5 seconds into the second quarter. The point-after try was blocked, and the score stood at 7-6 in favor of the Warriors. After the Damien defense forced a Warrior punt, Kamehameha stopped the Monarchs, but Pilares, who also serves as the punter, faked the punt and ran for 18 yards, extending the Damien drive. After Sheldon Bailey ran three times for 31 yards, the Monarchs were in business at the Warriors 18-yard line. However, the Kamehameha defense sacked quarterback James Skizewski for a 5-yard loss and kept Damien from taking the lead. The momentum shifted back to the Monarchs after Mike Kamikawa sacked Kaai, and Freyton Castillo returned the fumble 72 yards for a touchdown. After a Martin pass completion to Michael Sipili for the 2-point conversion, the Monarchs led 14-7 with a minute to play in the half. "(We were) beating ourselves," Kamehameha head coach Doss Tannehill said. "But they're a good team, too. Not taking anything away from Damien, because they played hard and smart. Most of the problem was with us." With 41 seconds to go in the second period, Kaai fumbled the shotgun snap and Damien's Braden Storaasli fell on the ball at the Kamehameha 19-yard line. The Kamehameha defense held strong, but went into the locker room at halftime trailing by seven. "They always play tough here," Tannehill said. "I got 'em fired up (at halftime) so they could work on controlling the line of scrimmage." Both defenses held strong throughout the third quarter, and in a battle of field position, the score remained 14-7. Pilares went to punt on his own 30-yard line early in the fourth quarter, but the ball sailed over his head, resulting in Kamehameha's ball on the Damien 6-yard line. After the Monarchs stopped the Warriors on three straight run plays, Bryson Vivas punched it in for the 1-yard score. Punahou's Colin Viloria picked up yards during last night's win over Saint Louis. River Kim kicked three field goals, including a 20-yarder with 1:18 left, as second-ranked Punahou edged No. 4 Saint Louis 16-13 last night at Aloha Stadium. Kim, a junior, also hauled in a key 18-yard catch during the winning drive to set up the decisive field goal. "It felt like a regular kick," Kim said of the attempt, which stayed just inside the upright. "My holder, Kyle (Whitford), has been holding for me since seventh grade. He makes me comfortable." Punahou improved to 3-1 in Interscholastic League of Honolulu play (6-1 overall) and kept pace with Kamehameha in the Division I race. The loss was a tough, but not lethal, blow for Saint Louis (3-3, 1-2 ILH). "We're still in it," said Crusaders wide receiver Cameron Bayne, who finished with five catches for 99 yards and a touchdown. Saint Louis got the ball back at its 35-yard line after Punahou's kickoff tumbled out of bounds. The Crusaders got no farther than their own 39-yard line, however. Penalties stifled the drive, as they did through much of the game. "We had missed opportunities," Saint Louis coach Delbert Tengan said, referring to a missed PAT kick and a missed field-goal try early in the game. "Those would've made a difference, just like the holding calls. We had some nice runs. The flags came late." As well as Kim played, it was a swarming Punahou defense led by Sam Higgins that kept Saint Louis in trouble. 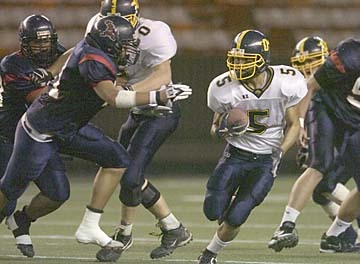 Punahou turned to its ground attack far more than usual, running 37 times for 135 yards. Kainoa Carlson gained 69 yards on 16 attempts, while Colin Viloria gave his team a new weapon out of the backfield. The senior gained 82 yards on 17 carries. "Nobody knows this, but our motto before this season was 'Pound that Rock,' just between the offensive line and running backs," Carlson said. "The big difference this time was Colin. Now we have a 1-2 punch." The commitment to running the ball took a load off Punahou's run-and-shoot attack, which sputtered at times against the Crusader defense. Miah Ostrowski, who had nine catches for 126 yards in Punahou's 31-20 win over the Crusaders last month, was limited to four receptions for 47 yards. Ostrowski, however, contributed with a huge 19-yard catch during the winning drive. Another key aspect of the game came in the third quarter, when Saint Louis quarterback Cameron Higgins suffered a concussion. He didn't return, and was replaced by Jeremiah Masoli. The transfer from California played in the first half and had crisp execution with seven completions in his first 11 attempts through three quarters. However, he also was sacked three times and completed just one of his final four attempts, throwing two interceptions. "That's not why we lost," Bayne said of his team's mistakes. "We had the game plan, but we didn't execute and play as a team. We got down on each other and didn't pick each other up. As a leader, I should've picked more people up." Saint Louis finally got on the scoreboard when Higgins connected with Bayne for a pretty 55-yard touchdown pass with 10:08 remaining in the second quarter and a 7-0 lead. Punahou mustered only four first downs and no points on its first four drives. However, Saint Louis penalties gave the Buffanblu a boost just before halftime. After a personal foul and ejection of defensive lineman Elliott Purcell, Punahou capped an 80-yard drive with Carlson's 2-yard touchdown run. Kim's PAT kick tied the game at 7 with 1:07 left in the half. Ryan Dung came through, just like coach Wendell Look expected. With starting quarterback Kiran Kepo'o resting with minor injuries, Dung stepped in to lead the seventh-ranked Raiders over Pac-Five. Dung, a 6-foot, 160-pound junior, completed 15 of 24 passes for 212 yards. He tallied three touchdown passes and just one interception as Iolani improved to 3-1 in Interscholastic League of Honolulu play (6-2 overall). "Ryan showed a lot of poise for being his first time in the line of fire," Look said. "He doesn't have a lot of experience, but he played like a veteran." Iolani also rested linebacker Jon Takamura, who has some minor injuries.